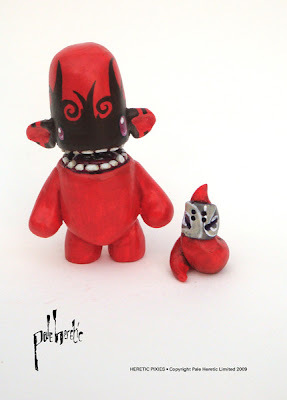 We Ain't Plastic Toy2R custom toy show opens tonight! WE AIN'T PLASTIC! opens at 6pm tonight featuring over 50 customized Qees from artists from the Lincoln and Omaha area. 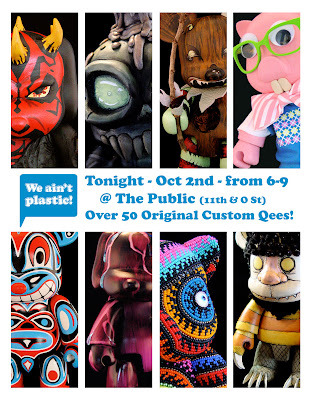 TOY2R announces the WE AIN'T PLASTIC Qee Exhibit being held in tonight in Lincoln, Nebraska. 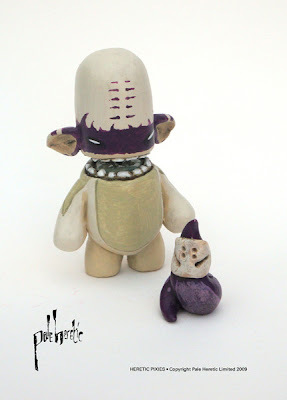 Over 40 artist from the Lincoln and Omaha are displaying customized 8" DIY Qees for this exhibit celebrating the first anniversary of the TOY2R US division. This event showcases some of the hottest design talent in the Midwest area and will serve as the launch for the 2010 Qee Worldwide Tour which celebrates the 15th Anniversary of TOY2R! In addition, special guest artists are submitting original Qee customs from across the country, including Jay222's Twin 16" Qees creation; Pablo y Francisco and New Jersey's Jan Huling displaying her amazing beaded Qee! The event opens tonight at The Public (11th and O St. inside The Black Market). DJ Nost and DJ Trinidad will be battling it out - and this time - its all out war! There will also be lots of free giveaways and special door prizes - so don't miss out. Pocket Wookie, Jason Buchner, Donovan Beery, Robot Luv, Suzanne Holzworth, Bennett Holzworth, Ryan Holt, Jeremie Memming, Brandon Miller, MISS CAKE, Paul Berkbigler, Nicole Gusafsson, Eric Nyffeler, Jen Lukas-Landis, Ben Swift, Nolan Tredway, Adam White, Nick Wieser, Jack Irons, Tyson Schaffert, Nate Voss, Steve Gordon, Dan Moore, Patrick Bradley, Jeff Bockoven, Peter Worth, DreamTree Toys, NORM4EVA, Oakley Jason, Zeljka Hassler, Pete Lochren, Deb Lee Toth, Mike Rudolf, Zac Burton, Ken Kavanaugh, Sarah Calico, Adam Nielsen, Aaron Peterson, Dave Nelson, Michael Neilsen, Rugger Holmes, and Brook Taylor. The Event is Sponsored by Local Hero, Dream Tree Toys, and the Blue Orchid Restaurant. Join the fan page on FACEBOOK for updates and special sneak peeks of the customs as the show continues all month long. Don't miss this mid-west event! For more information email info@toy2rusa.com. 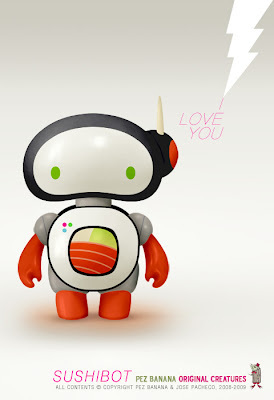 Preorder SushiBot now for only $30 (special preorder price) at PatchTogether. Design by by Pez Banana from Venezuela. 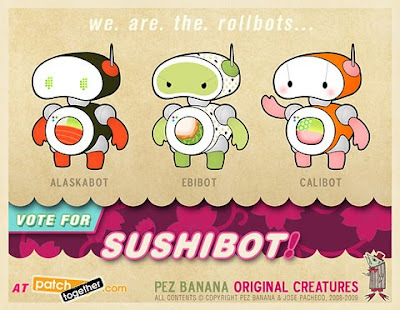 Now they come to life together in the form of cute, quirky -and occasionally mischievous- little robots!Sushibots can be whatever and whoever you like, but they start out as three of the most popular varieties of makizushi: Alaskabot (alaska roll), Ebibot (ebi roll), and Calibot (california roll).Sushibots are ready to fill your day with coolness, love, and flavor! (and a hint of fresh geekiness). "Hand painted, numbered, unique original Heretic Pixie. Resin cast, includes pet worm. Hand painted custom, there won't be another exactly like this! Height 10cm approx." Buy them here. Learn more here. 8" Voltaire Adventure Quest Deady Qee Bear from Toy2R! 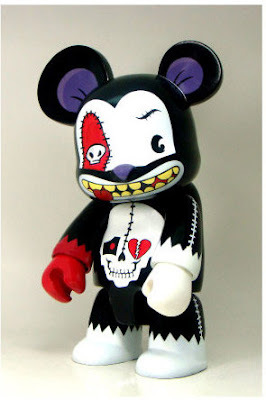 The latest iteration of Voltaire ever-popular Deady Bear character is being released soon from Toy2R! $55 each. Contact us to request one! Arriving around October 2009. Voltaire (musician, toy designer and creator of the DEADY graphic novel series) has teamed up with one of the web's most popular massive multi-user online role-playing games to create one of the more exciting DEADY toys made to date, the ADVENTURE QUEST DEADY 8" Qee! 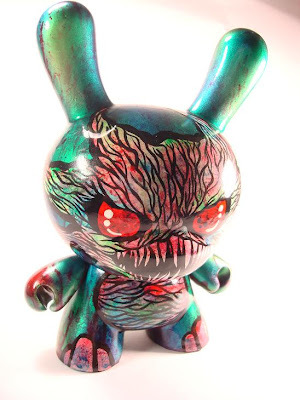 This Qee (by the premier designer vinyl company Toy2R) is the product of a unique collaboration. On Friday the 13th, March, 2009, Voltaire (in animated form) along with his evil teddy bear, DEADY, led a LIVE, 3-hour quest on the on-line game, Adventure Quest Worlds. Players who tuned in, followed Voltaire and Deady onto a haunted pirate ship, sailed across monster infected waters and landed on the shores of Skull Punch Island in search of a cursed guitar. And all the while, Voltaire sang songs from his latest CD, "To The Bottom of the Sea". Adventure Quest creators, Artix Entertainment, expected 11 thousand players. They were prepared for 25 thousand. After an unprecedented 30 thousand-plus players logged on to this one-time event, the servers crashed! (Hey, what do you expect on Friday the 13th?) But within moments, Artix had the game up and running again. The event proved to be so popular, that is has been added as a permanent fixture in the game and can be played at any time at www.AQ.com. The ADVENTURE QUEST DEADY 8" Qee comes in a full color box wrapped in gorgeous art from the Adventure Quest Worlds game! Voltaire 8" Deady Qee Bear + digital downloads!